QUANZHOU, CHINA--(Marketwired - Nov 30, 2017) - Fresenius Medical Care (FME), the global market leader in dialysis, launched last week in Quanzhou its first independent dialysis center in China. "The opening of our first independent and stand-alone Fresenius Medical Care dialysis center in Quanzhou is another important milestone for us on the way to further expand our business in China," said Harry de Wit, CEO of Fresenius Medical Care Asia Pacific. "By working closely with the Fujian government, we built the center in order to perfectly meet the needs of kidney patients in the region." The Fujian Province is at the forefront of China's new medical reform movement that promotes the collaboration between public and private medical providers. At the beginning of 2017 the Fujian Provincial Health and Family Planning Commission published the "Notice on the Planning, Creation, Registration and Management of Dialysis Centers." It especially encourages private dialysis providers to further promote close support between public hospitals and non-public medical institutions. The newly-established dialysis center of Fresenius Medical Care in Quanzhou serves as a successful example for Fujian to adopt leading medical practices and well trained medical staff in their health care provision to deliver high-quality services. Fresenius Medical Care is the world's largest provider of products and services for individuals with renal diseases of which around 3 million patients worldwide regularly undergo dialysis treatment. Through its network of 3,714 dialysis clinics, Fresenius Medical Care provides dialysis treatments for 317,792 patients around the globe. Fresenius Medical Care is also the leading provider of dialysis products such as dialysis machines or dialyzers. Along with the core business, the company focuses on expanding the range of related medical services in the field of Care Coordination. Fresenius Medical Care is listed on the Frankfurt Stock Exchange (FME) and on the New York Stock Exchange (FMS). 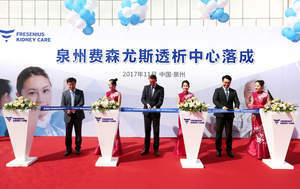 Left to right: Alan Chen, Executive Vice President, Fresenius Medical Care, China, Harry de Wit, CEO of Fresenius Medical Care Asia Pacific, Bryan Jiang, General Manager, Fresenius Kidney Care, China, at the opening ceremony of the Fresenius Kidney Care Quanzhou Dialysis Center on Wednesday, 22nd of November.